Have some on hand? Go Here to browse EDEN Recipes that use it. 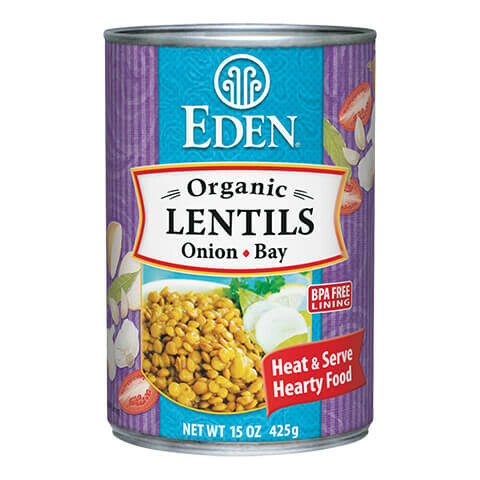 Eden Organic Lentils with Sweet Onion & Bay Leaf are a thick, rich stew of green lentils, expertly prepared at our certified organic, pareve cannery. Lentils are soaked overnight and cooked with carefully selected ingredients including our own organic shoyu soy sauce and organic tomato puree and the perfect balance of organic onion, organic garlic, and bay leaf. Eden Organic Beans are packed in steel cans coated with a baked on oleoresinous c-enamel that does not contain the endocrine disrupter chemical, bisphenol-A (BPA). Oleoresin is a natural mixture of an oil and a resin extracted from various plants, such as pine or balsam fir. These cans cost 14% more than the industry standard cans that do contain BPA. The can maker, Ball Corporation, tells us that Eden is the only U.S. food maker to date to use these BPA free cans and we have been since April 1999. Our lentils are selected at the farm from our dedicated network of organic family growers. The growers' constant care and vital organic soil produce the world's most appealing and nutritious food. For the third time in 2004 Eden Organic Beans received the highest rating for flavor and nourishment in exhaustive comparison studies of canned beans by the Center for Science in the Public Interest (CSPI) in their Nutrition Action Healthletter. Eden Organic Refried Beans were named 'Best Buy' and number one for nutrition among 38 brands with salt added. In 2004 Eden beans were rated as favorites by Men's Health and Child Magazine. In the June 2006 article "125 Best Foods for Men," Men's Health again rated Eden Beans as the best beans for having great flavor, being heart healthy, promoting weight loss and offering "The highest fiber with the least amount of sodium" among all other brands. Lentils Lens culinaris are small and 'lens' or disc shaped legumes native to the Middle East and are known as 'dal' in India. Lentils have been an important staple food for at least 8,000 years and are mentioned in the Book of Genesis where Esau sells his birthright to Jacob for a thick bowl of lentil soup. Lentils come in many colors. These are the finest quality, bright green when dry. According to the FDA, "Low fat diets rich in fiber containing grain products, fruits, and vegetables may reduce the risk of some types of cancer, a disease associated with many factors." Eden Organic Lentils are fat free and a good source of dietary fiber. They are also a good source of protein, iron, phosphorus, and zinc. Most seasoned beans contain refined sugar, harsh salt, chemical processing aids and preservatives. Commercial canners put chemicals in with beans to harden the skins so that they won't fall apart in the can as they cook. They also add a chemical to hold the color. Eden organic beans come out perfect with none of these additives. Because of the vital soil that produces them, their much higher mineral content and stronger skins allow them to be cooked without need of processing chemicals, and their vibrant colors hold fast. Our cannery, Meridian Foods located in East central Indiana, has a long standing reputation for putting out cooked canned beans of a better quality, fill, and finish than any other cannery in the United States. Studies show beans contain a wealth of antioxidants similar to those in fruits and berries. "Beans are really loaded with antioxidant compounds," said Clifford Beninger, Ph.D., an environmental biologist and former researcher for the USDA's Bean Research Unit. "We didn't know how potent they were until now. In general darker colored seed coats were associated with higher levels of flavonoids, and therefore higher antioxidant activity." Researchers tested the antioxidant activity of flavonoids found in 12 common varieties of dry beans. They found one class of compounds in particular, anthocyanins, were the most active antioxidants in beans. These findings add antioxidant activity to a growing list of healthy compounds found in beans and legumes. The study was published in the Journal of Agricultural and Food Chemistry. Enjoy Eden Organic Lentils with Sweet Onion & Bay Leaf as a side dish, in soups and spreads. There are seven soups recipes, three delicious spread recipes, and more in our recipe section.